Saint John of the Cross, Priest and Doctor – My Catholic Life! The shock of the Protestant Reformation lit a purifying fire in the Catholic Church. Accretions were burned away that had silently accumulated over the centuries in the house of the Church like so much old furniture. Besides the universal reforms of the Council of Trent, men and women such as Saint John of the Cross were integral regional players in the Catholic Counter Reformation. This movement stripped dioceses and religious orders of all fat and then built up a lean and muscular Body of Christ that moved with purpose and vigor for the next four centuries. But for many purifiers, including Saint John of the Cross, the price of such reform was steep and it was personal. Needed changes to his beloved Carmelites would mean the disruption of comfortable patterns of life. John’s ideas had enemies, and for his efforts he suffered exile, hunger, public lashings, imprisonment, and defamation from the hands of his own fellow Carmelites! Saint John was born into poverty and so was no stranger to need. He was raised by his mother and the Church after his father died at a young age. These two mothers imparted to his mind a solid formation in Catholic doctrine and to his soul an ardent love for the Lord Jesus. John was ordained a priest for the Carmelites in 1567. He loved solitude and contemplation and so considered entering the strictest of Orders, the Carthusians. But holy people cross paths, and a chance meeting with Saint Teresa of Avila redirected John’s vocation. Teresa’s combination of charm, intelligence, and drive were difficult to resist, and John fared no better than most. He quickly joined her project to recapture the original purity of the Carmelite Order. Many customs had attached themselves to the Order over time like barnacles on a ship. Now was the moment to scrape off the barnacles. John set out to found new, reformed Carmelite houses and to reinvigorate existing ones. The reforms John and Teresa implemented were practical. The monks and nuns were to spend more hours chanting the breviary in common, to do more spiritual reading, to spend more hours in silence, to practice contemplative prayer, to abstain completely from meat and to endure longer, more radical, fasts. The reformed Carmelites eventually became known after their most noticeable change. They strictly adhered to the Carmelite Rule’s original prohibition against wearing shoes. So by the time they were canonically established as their own Order, distinct from the historic Carmelites, they were called the Discalced, or Shoeless, Carmelites. Saint John spent his life traveling throughout central and southern Spain carrying out an intense priestly ministry all while living a recollected life which his own contemporaries recognized as saintly. He was a chaplain to convents, a spiritual director to university colleges, a confessor, a preacher, a founder and a superior of monasteries. And, most distinctively, he was a contemplative who wrote with elegance and artistic flower about falling in love with God. His Dark Night of the Soul, Spiritual Canticle, Ascent of Mount Carmel, and Living Flame of Love are, on their surface, poetic masterpieces of the Spanish language. At a deeper level, they each describe, in surprising detail and through various biblical metaphors, the soul’s search for Christ and its joy in finding Him, or its pain in losing Him. For John, being authentic was not a spirituality. Being bonded to Christ was. To see through material forms into God’s inner life, to contemplate God in His very nature, was prayer. The soul seeks God like the bride seeks her bridegroom. And the Bridegroom was more than an image, it manifested a reality. The Church is both mother and bride, and her faithful learn of Christ, and seek Him, only inside of her life. Saint John of the Cross deepened the word “mystery” to include more than its objective meaning in the Sacraments. For John, every soul had a mysterious union with God that had to be, and only could be, cultivated in silent contemplation. 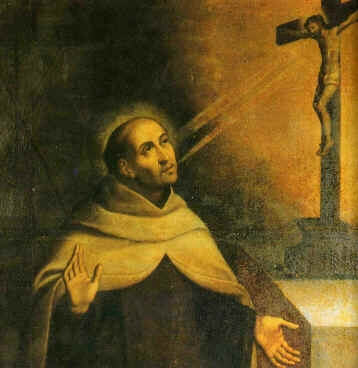 Saint John of the Cross, your life of prayer was deepened by your life of suffering for the good of your Order. Through your writings on the mystery of God, may we come to love Him, if not understand Him, all the more.